I had been anticipating the 2003 Davis Brevet Series for well over 9 months now, and the time had finally come! An achievement in itself, this cycling series was actually just a stepping stone to get to where I really wanted to go—Paris. 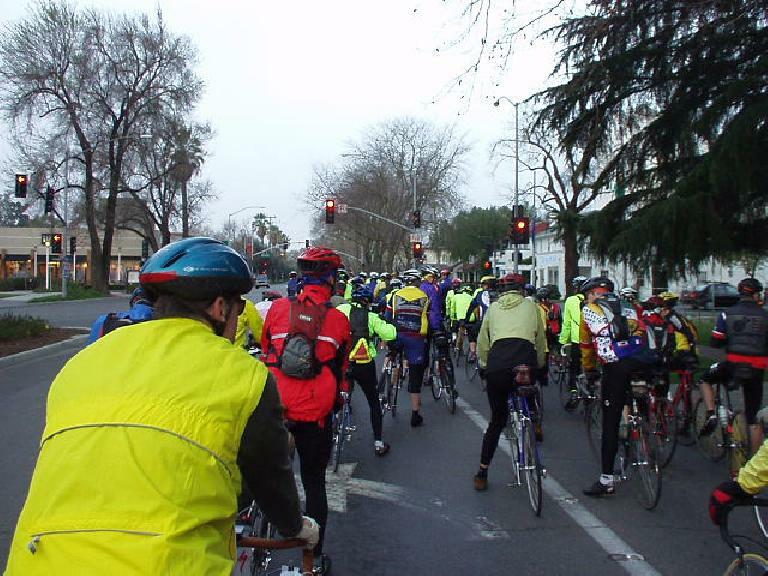 Yes, for me the road to Paris was to go through the quaint little Northern California town of Davis, home of cows, the “Aggies” (students of UC Davis) and also one of the most dedicated ultra-cycling clubs in the world, the Davis Bike Club. But how could this be? What’s more, one must complete those distances in order, and within specified (and admittedly, very reasonable) time limits. And it’s really not that crazy (everything is relative, I guess)—Paris-Brest-Paris, the oldest bicycle race in the world and now held every 4 years, is 1200km, or about 750 miles! So bring on the brevets! 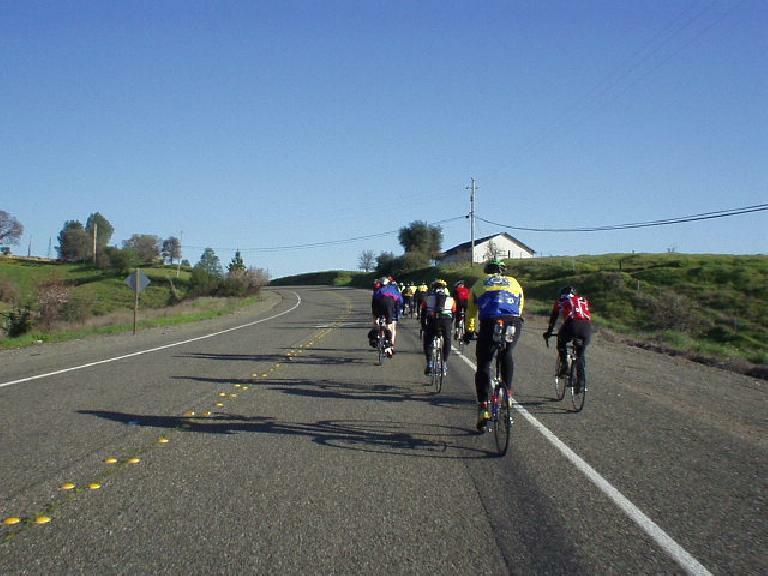 Thankfully, the weather forecast for the 2003 Davis Brevet called for clear skies. I say thankfully, because the first (and last) brevet I had ever done up to this point was the 1999 Davis 200km Brevet, which was the coldest and wettest ride I have ever done. Make that the coldest and wettest I have ever been, for that matter! I really wanted dry weather this time, and got it. 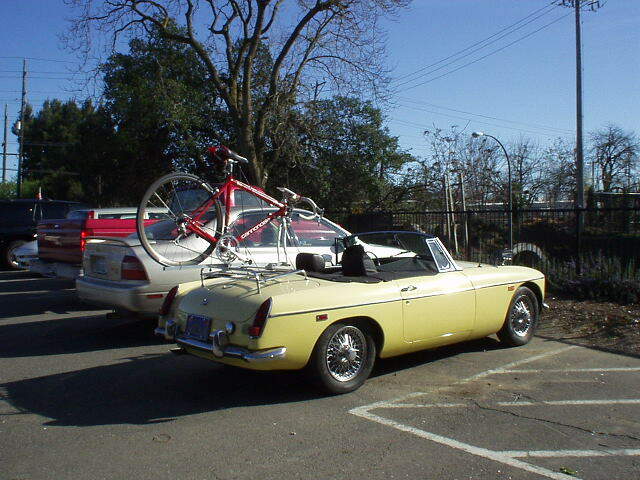 I made the 95-mile drive to Davis from Fremont the night before in Goldie the MG, with the full intention of sleeping in my car for a good 5-6 hours before the ride. In fact, I made it to the Boy Scout parking lot (the start of the ride) at 1:00 a.m., but this particular location wasn’t exactly conducive to sleeping! First off, the stereotypically quiet Davis town was surprisingly non-quiet at this time of night, with college punks yelling or breaking bottles in this downtown area from 1:00-2:00 a.m. The parking lot was really well lighted, too—making it harder for shuteye. To top it off, a train would pass by *20 feet* from the parking lot every hour! Hoot hoot! I resolved that in the future, I’d sleep at home, set a few alarm clocks and drive to the start an hour before the ride, not 6 hours before. Many other cyclists indeed were starting to trickle into the parking lot at 5:45 or so. This year a record 200 cyclists signed up. Surely, not even half of these intended to do PBP, but that was an impressive number for this early season, self-sufficiency-stressed ride. The parking lot was quickly full, and the late arrivals presumably had to find parking in the parking structure across the street lest they meet the wrath of the parking police by parking in the 2-hour spots along the street. My friend Russ from the tri-City tri Club was here. 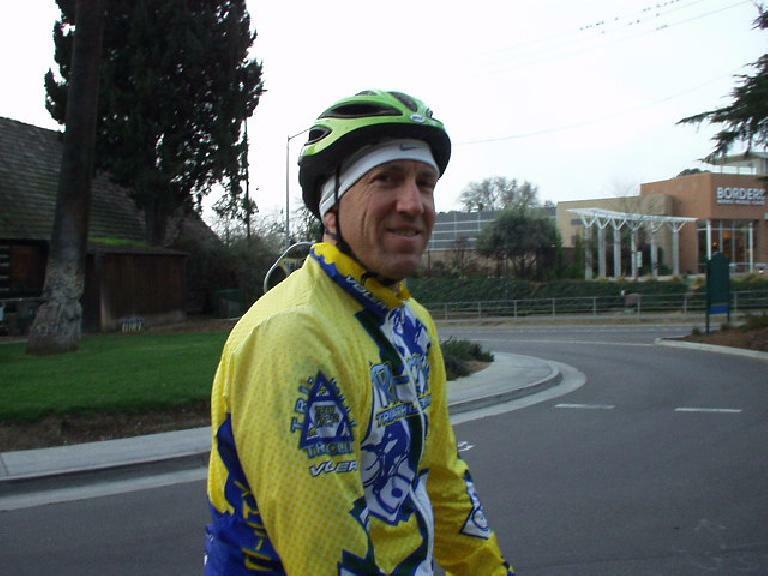 His motivation was to do a longer, not-to-hilly ride to help out his time-trialing in Ironman triathlons. This ride was a closer alternative to the flatter-but-shorter Solvang Century, which fell on the same weekend. All the riders gathered for a mass start. Off we went at the tick of 7:00 a.m.! Russ and I rode in a group, perhaps one of the middle ones, for the first 20 miles. The morning was brisk, but with my beanie hat from the 2002 World’s Toughest Century, I stayed sufficiently warm and comfortable. My thoughts on fashion: not much has changed over the years, though it seems to be almost a requirement for a cyclist to wear a jersey that has some words or logos on it. I wore my blue-and-white California triple Crown jersey from 1998; Russ donned his yellow tri-City tri Club windbreaker. Most other cyclists wore jerseys of the bike club they belonged to or of their favorite professional European cycling teams. In contrast, in the early nineties, the majority of people wore a generic plain-colored jersey such as the one I donned in the 1997 Davis Double. Indeed, those who wore jerseys of professional race teams were often looked upon as “poseurs” back then by some of the more arrogant types. Anyhow, back to the ride. For the first hour, Russ and I were riding in a group in which was riding in what I’d describe as a “pedestrian pace”. Apparently, Russ must have felt so too, because after taking a turn at the front, he started to push a lot harder, in which I was very glad for. I was rarin’ to go! His pace was less than his time-trial pace, but quick enough that no one aside from myself wanted to go with him. He and I continued at this faster pace all the way along Putah Creek Road, switching off regularly to avoid burnout, and passed several riders. Sometimes one or two of them opted to join us, only to let off again. Russ and I finally let up upon encountering a rather large paceline near the end of Putah Creek Road. And then came the first hills. At the base of the first hill, by Solano Lake (or is it Lake Beryessa? ), was when the pack started to disperse. Many people stopped to take off some clothes. Some stopped at the Markley Cove store for food. I think Russ was one of them… in contrast, still rarin’ to go, I continued on, going strong up the first hills. Cardiac here I come! 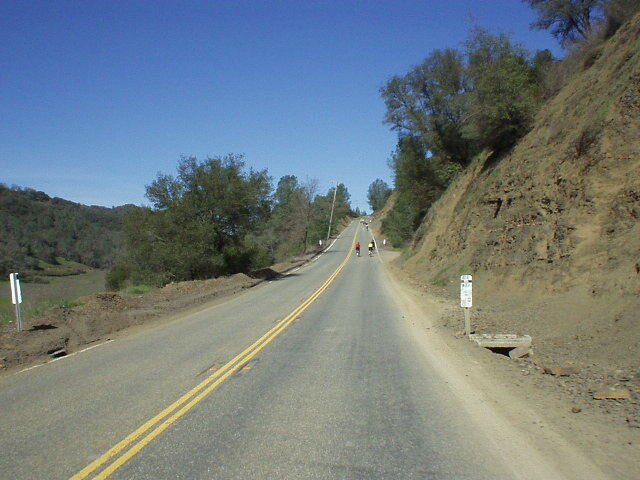 “Cardiac” is the name of a classic climb that is to Davis as what Old La Honda is to the San Francisco Bay Area. Now, I know that those readers who have not lived in either in those areas have no idea what I’m talking about, but what I mean is both of those climbs are medium length (20-30 minute) climbs in which many cyclists know their best times for going up them. They are personal measures of one’s hill-climbing ability. I’ve never timed myself on Cardiac, though I’m sure it’s not even close to the record, which I believe is held by Steve Larsen, the professional Ironman triathlete who was once rode on the same professional cycling team as Lance Armstrong. In any case, I have done this climb on at least a half-dozen other Davis-area bike rides, and each time, I didn’t think the climb was deserving of its name. In this 200k brevet it is indeed one of the more difficult climbs, but still it is only 6-7% grade, and it is not particularly long, which I define as requiring 45-90 minutes, such as something like Page Mill Rd., or Mt. Diablo. On this particularly day I felt no different about the climb, as it seemed to be over fairly quickly. After Cardiac were some nice sweeping descents on some of the best-maintained roads I’ve been on in recent memory. Roads are wide and sweeping; braking is hardly ever required; and cars tend to give ample passing room here. Next came Lower Chiles Rd. and Pope Valley Rd… more roads covered in the excellent Knoxville Double. It was mostly rolling, and I was riding mostly alone. Taking advantage of the non-technical terrain, I was in a tight aero tuck fairly frequently, trying to maintain as much of an efficient profile as possible. And this is where my problems began. 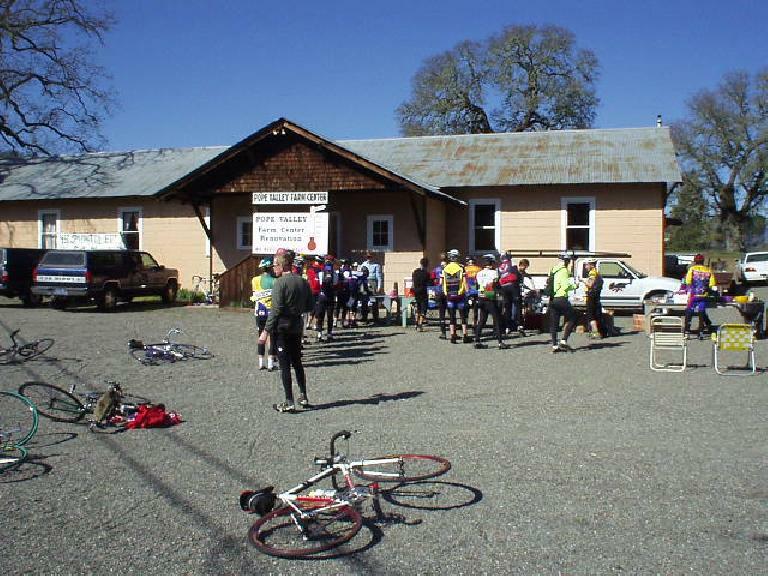 I got to the midway point, Mile 63.9, at Pope Valley Grange Hall at 10:40 p.m. Wow, that was pretty fast!—an average speed of 17.4 mph, both on-bike time and overall-bike time, since I did not stop a single time during those 63.9 miles. I judged this fast considering that there was net altitude gain—Grange Hall is about 1000 feet above Davis (which is at sea level), and there were several dips in the elevation profile along the way to add even more climbing. However, my body had taken its toll from the effort: I could hardly stand up! Apparently he had read my stories on this website. Wow, that was pretty cool! It was nice to meet you, Wayne! Another friendly guy lent me some sunscreen, which I had dumbly forgotten to put on before the ride, and not wanting to waste too much time, I was back on my bike. It was merely a matter of retracing all of the roads I had already ridden on now, since this (like all of the Davis Brevets) was an out-and-back course. A few miles down the road was Russ going in the other direction, all alone. He was looking good. I, on the other hand, was not feeling very well at all. It took almost 30 miles for me to recover, but just in time for the back side of Cardiac. Up again with no problem, and then, a most-welcome descent! Back in the flat agricultural line on the outskirts of Davis, there was a secret control point in which I had to stop, but also had the benefit of having some water. After this my form had completely returned and soon the Mondave Center, signifying that I was back to the UC Davis campus, was near. I arrived at the official finish at 2:55 p.m.. not quite even mid-afternoon yet. A good ride ending at a good time! It is preferable to sleep at home the night before the brevet and then wake up early and drive to the event, instead of trying to sleep in my car in the Boy Scout Parking Lot, which is just not conducive to sleeping. In future brevets I will need to pace myself better. Still, 200km is short enough that I can go hard in the beginning, blow up, spend some time to recover, and finish the ride, without feeling too miserable. In fact, the ride still remained highly enjoyable. It might behoove me to stop maybe once or twice to stretch for a minute or so between long legs of the ride—such as that first 63-mile stretch—instead of riding the entire distance without stopping (and then can hardly straighten my back afterwards). Or, I need to stretch more on the bike. Next brevet: the 300km Davis Brevet. Scenery: 2+. Not bad, but quite familiar. Support/Organization: 2. Good organization but truly a no-frills ride emphasizing self-sufficiency. At least the registration fee is very low! Weather: 2+. A bit cold, but dry and not bad. Relative Difficulty: 3-. All of the course is flat or rolling. However, every time I do a Davis ride, I find the “little climbing” deceptive! Overall Rating: 3. Not the most exciting, but not a bad ride.